Teardrops n Tiny Travel Trailers • View topic - ADV-House: An 8x18 renovation. 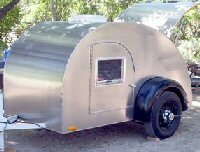 In 2014 we purchased an 8x18 enclosed trailer from H&H in Denver. At the time we lived in south Denver near Castle Rock and vacationed in central and western Colorado and eastern Utah with dirt bikes and dual sport bikes. We do a little hiking on off days. The trailer was a great upgrade over tent camping. Over-night rains were less of a worry, we had a comfy mattress instead of the ground, and ohhh the space! 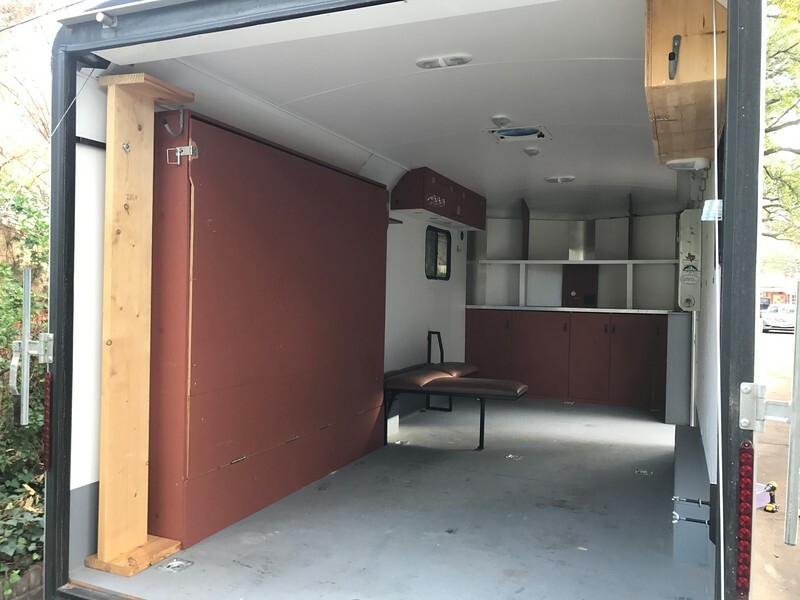 I painted the interior, installed a murphy bed, cabinets, and a few other essentials and we used the trailer for 3-4 weeks each year and several weekends. We didn't use the bathroom or cook in it, but it had everything we needed and nothing we didn't. Except a heater. We like being warm. August nights at 10,000' can reach into the 20's. Brrrr. And a water tank. Lugging those 50 lb blue cubes around gets old. And a shower. We like to get dirty and then get clean. 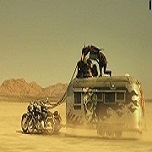 Like hot water, steam coming out of the shower-tent clean. Yes, clean camping or I believe it's called Glamping. We're dirt-bike-glampers. 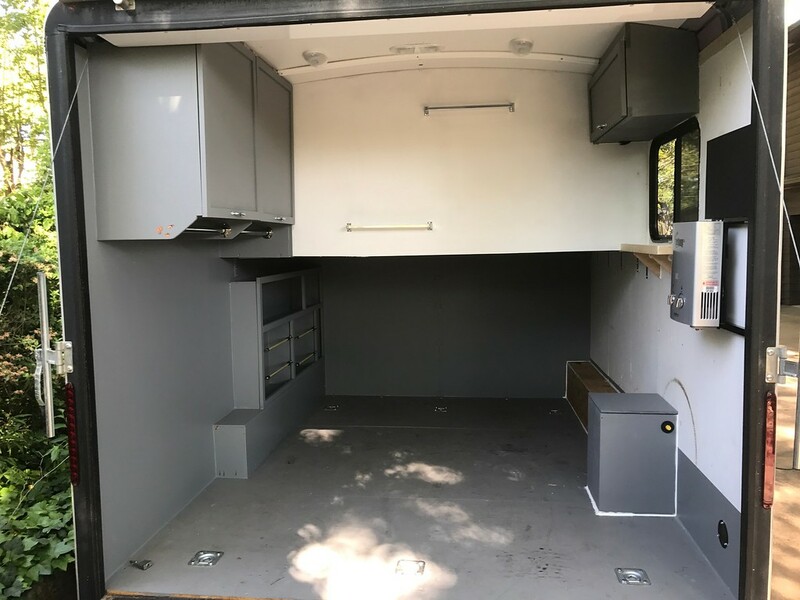 The cabinets in the front hold all of our camping, cooking, drinking, powering gear, etc. Other cabinets hold dirt bike gear and the big orange thing on the left is a queen size murphy bed. Here's the trailer in its current state (will try to keep this updated). The notional plan is to take the trailer down to the studs,address questionable build quality issues and 4 years of wear, insulate, and go from there. 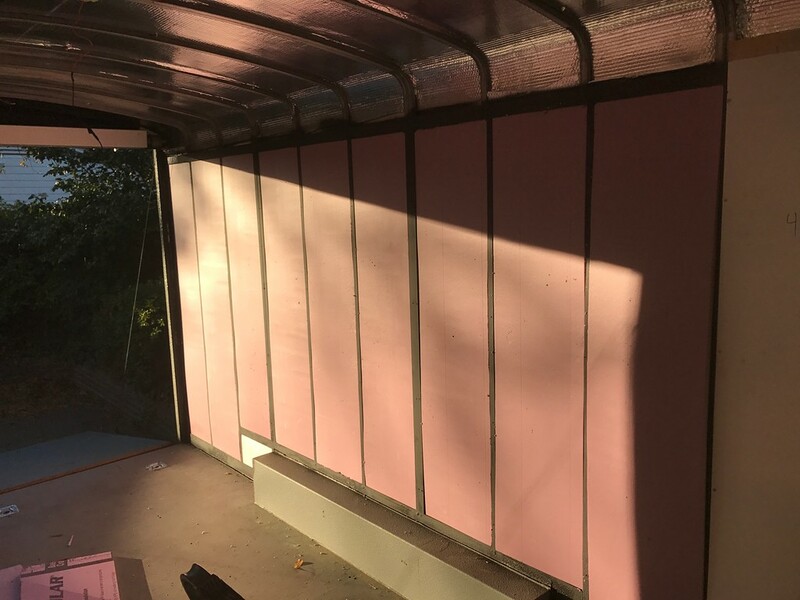 We ordered the trailer from the factory with roof insulation, but not in the walls. 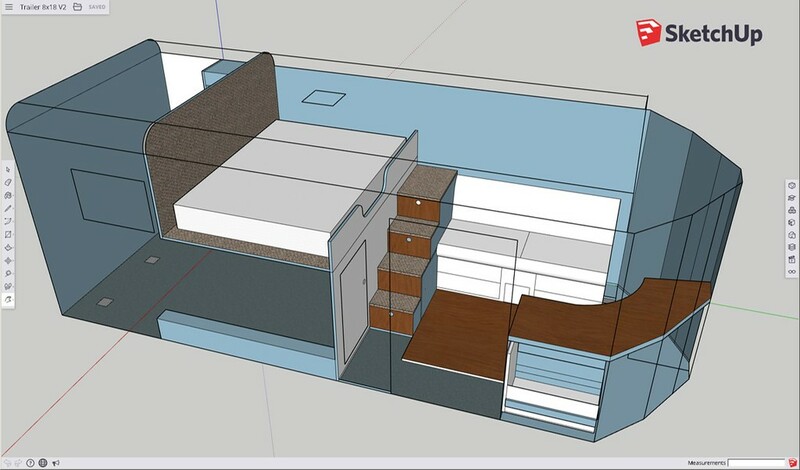 If you haven't found sketchup, do check it out. It's a free 3D CAD program that you can teach yourself to use in 10 minutes- https://www.sketchup.com/. I spent a few hours and built this model of our plan. -Walls are 81" straight up. Roof is slightly domed. -garage compartment is a little over 10' front to back...full height component is a little over 4'. I have a boat-load of questions and have found this forum to be invaluable. Please ask if I can help in any way and I'll be looking for some your help soon!! Stay tuned. Last edited by PigTrail on Tue Apr 17, 2018 3:05 pm, edited 20 times in total. Re: ADV-House: An 8x18 renovation. Looks like a very nice plan. Why not make tje loft bed, but leave the back open to the front so you have a nice big area to lounge around in when the toys are out. I did that and love it. You could alternatively just put a curtain up instead of a wall... 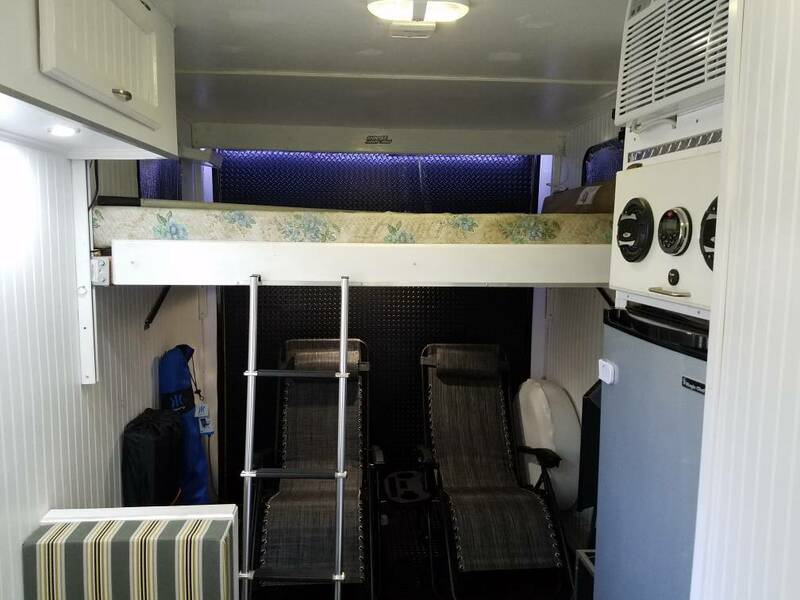 I forgot to ask how tall the trailer is inside... maybe that won't work unless you can raise the bed to the ceiling on tracks.. just some thoughts to maximize utility when toys are out. Just saw you have 81 inches height to work with. Maybe a bed on tracks to elevate then you can have full access to the garage for living when needed. FLBoy, thanks for the comment and photo. I've followed your build closely and like the idea of below bed storage for the bikes. Your build definitely inspired my design. What is the distance from the floor to the base of your bed support beam? How much room do you have above the bed? My wife is a little claustrophobic and want to maximize the open feel. We have 81" walls and it rises towards the center where it's almost 7' 5" (89") below the vent. Lots of room to work with. On the one hand I like to have open space, but I also like the idea of a "dirty area" and a clean area. Keep the suggestions coming. I plan to permanently mount the Triton system inside the trailer on the right rear wall in the "garage" area. This way it's vented through the window in addition to usually having the rear ramp down while in operation. The Triton system takes 2D batteries for the starter. I've seen, but can't find the link, to someone who hard wired one of these into their 12v system using something to step down to the 3V (2d batteries). It was also a little unit that fit in the hole where 2 d's would have gone. Anybody seen this or have a link to it? It appears this window has been leaking. I'd rather not replace the 30x20 window if I don't need to. 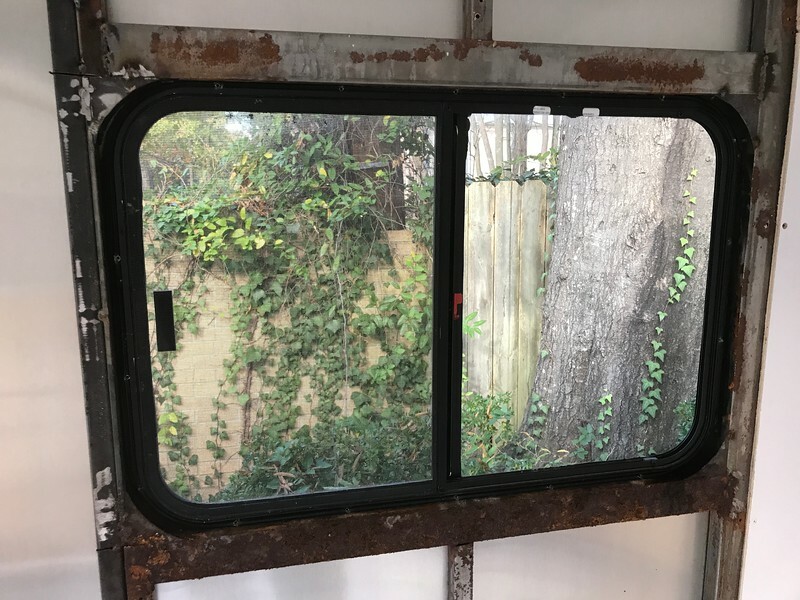 What are common leak sources?....or do all rv windows leak eventually and need to be replaced? Should I add more caulk around outside and button back up? I'd rather not patch something only to find it leaks a year later, but I also don't want to throw $ at a problem that could be fixed with gasket sealer. 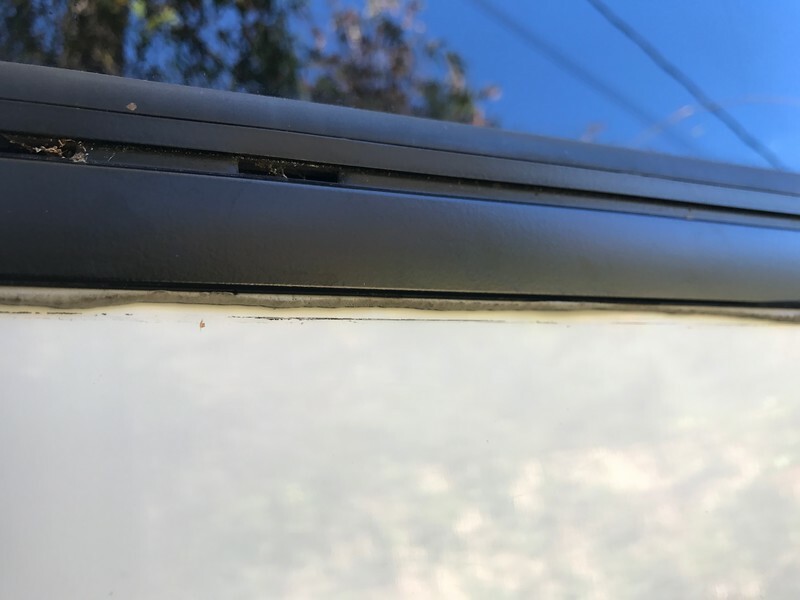 Any thoughts on common window leak points is appreciated! From my experience when I installed a couple of windows is the margin for error is really small. There isn't much of a flange on the windows, and even less of a gasket, to seat on the exterior skin. After I installed mine, I added a small bead of some black silicone caulk around the frame. 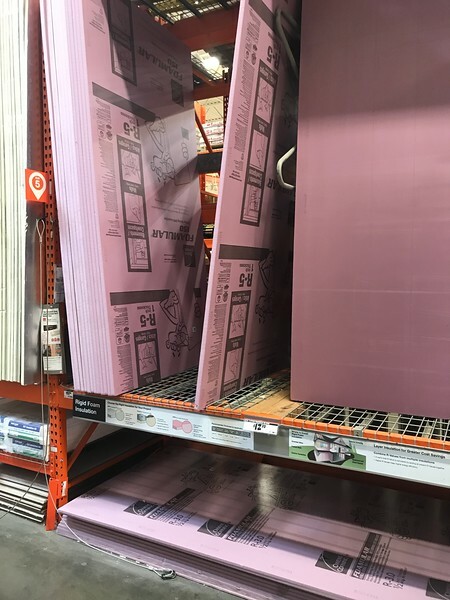 My local Home Depot has the "pink stuff" in 1/2", 1", and 2" thicknesses. The ribs on my trailer are 1x1" square tubing, so I'm using 1" for the walls. I purchased a sheet of 1/2" to test fit on the roof. This will go right over the already glued in reflective insulation. My procedure will be something like. Cut and "friction fit" insulation. Tape where necessary to hold in place. Fill gaps, etc. with Great Stuff foam. Re-attach wall plywood with line of Liquid Nails glue at the base. However, before tackling the insulation I need to clean up a few things. A wire brush, rust removal wheel for my grinder, and some elbow grease makes short work of any corroded spots. Rustoleum Primer goes on after cleaning. The window on the left is the offender in need of additional TLC. PigTrail wrote: It appears this window has been leaking. is what is needed for the outside between the skin and the window frame. other corrosion up as well before you put the wall back up. you should see a good squeeze of butyl putty escaping all the way around the frame. You can either clean it off or leave it alone, your choice. What Hank said. Also make sure the weep holes were and are on the bottom. Thanks! Butyl putty tape ordered. I don't want to spend $90 for the joy of hard-wiring two D batteries out of existence. I imagine the 12v-->3v step down in the pricey part. Looks like this is what I really need to go from 12v to 3V: DC Converter Voltage Regulator. And it's only $7.95. I have had the same batteries in there for 3 years. They are only used for a second or two to spark up the ignitor. Probably last longer than I will. The sun was shining on Saturday, so with the Butyl tape frosting in the freezer I pushed the window out of its factory position. 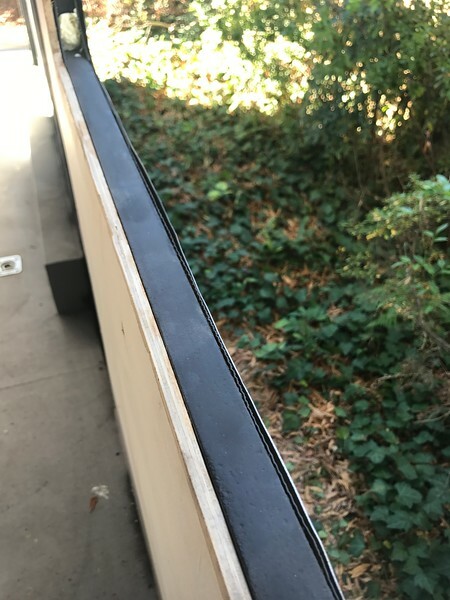 The stock window had a modest rubber seal and a thin bead of caulk. 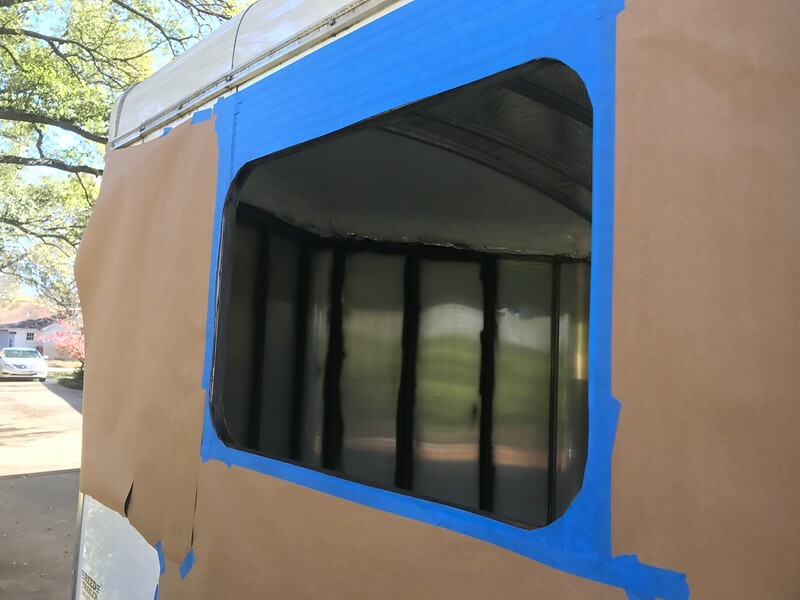 You can see the ring of caulk on the trailer and this gives you a sense of how little area the rubber seal actually contacts around the margins of the window. No wonder it leaked! After peeling, picking, and scraping off the remnant caulk I used a liberal amount of painters tape and paper to prep the area for primer. I also touched up the interior metal beams with a grinder fitted with a paint removal wheel. And wallah! It's like new. This shot is just before window installation. 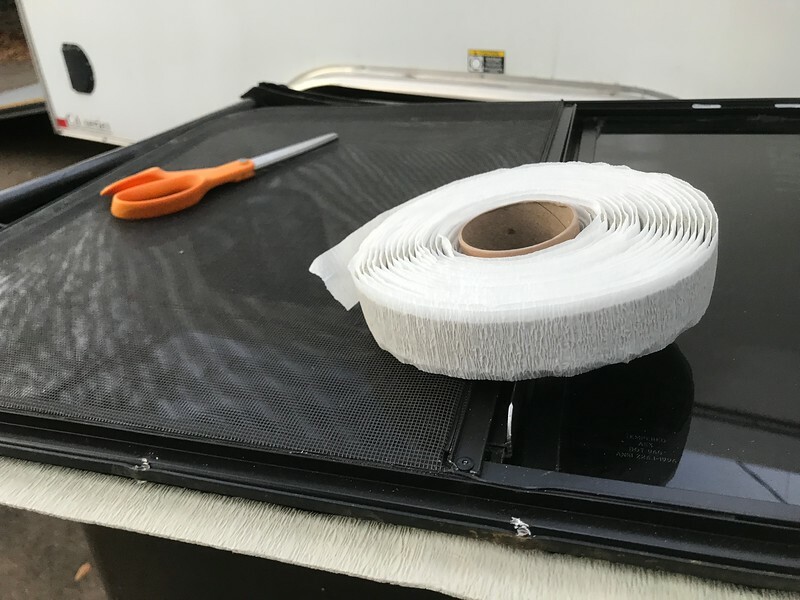 At this point I pulled the Butyl tape out of the freezer, propped the window up on my trash-can, and carefully applied the tape. Thankfully my better half arrived home a few minutes later, so I had an extra set of hands to hold the window in place. I looked for the Butyl tape to squeeze evenly around the edges to be trimmed later. Caulk will be added to finish the install. 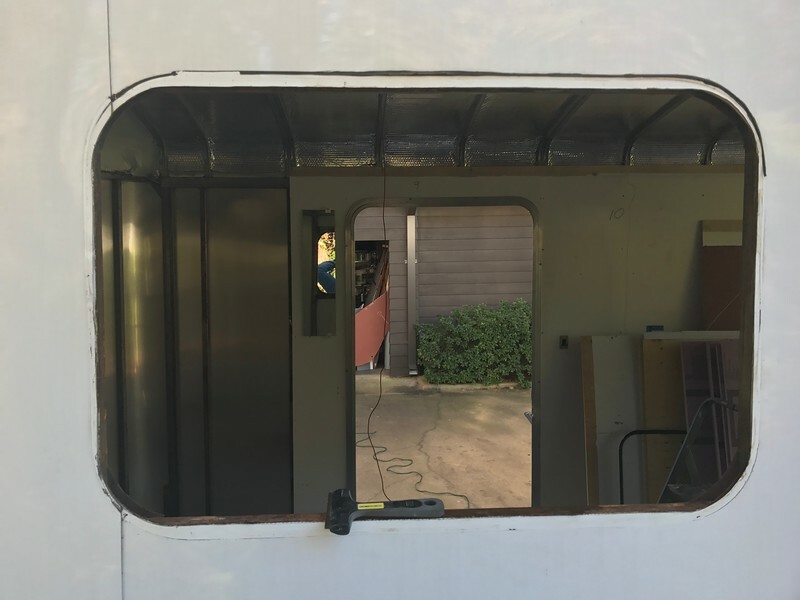 It's really, really intimidating to open up the side of a trailer, but these windows are very simple and trust me....you WILL do a better job than the guys from the factory. 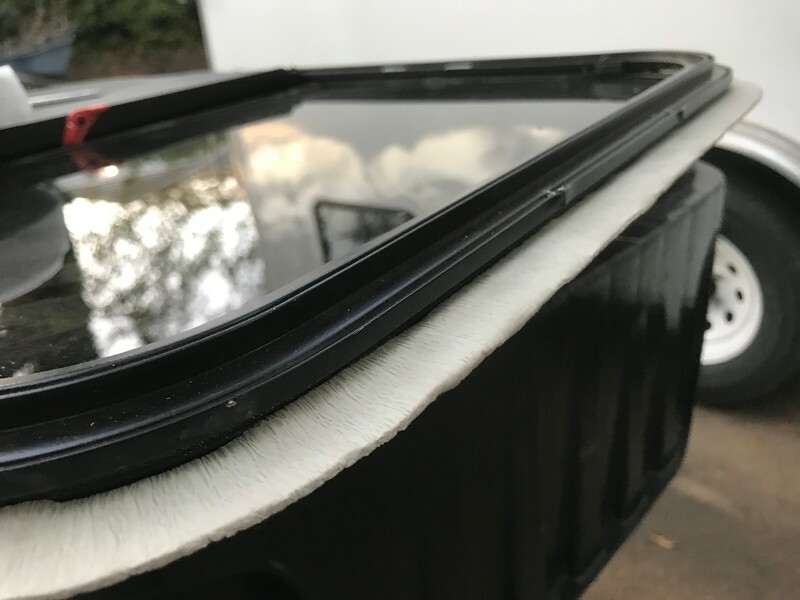 So, if your window leaks or if you're upgrading the interior do yourself a favor and make sure the window seals are good. Butyl tape on Amazon https://www.amazon.com/gp/product/B0070O93HA. I'm using the foam insulation board from HD...the pink stuff. The walls are 1" posts, so there is just enough room for the 1" foam board. It's rated R5. I measured twice and cut once, so was able to friction fit the pieces with no glue. Here's the drivers side up to the window. My posts are on 16" centers, so each sheet of foam board does 3 "panels" with some scrap leftovers. 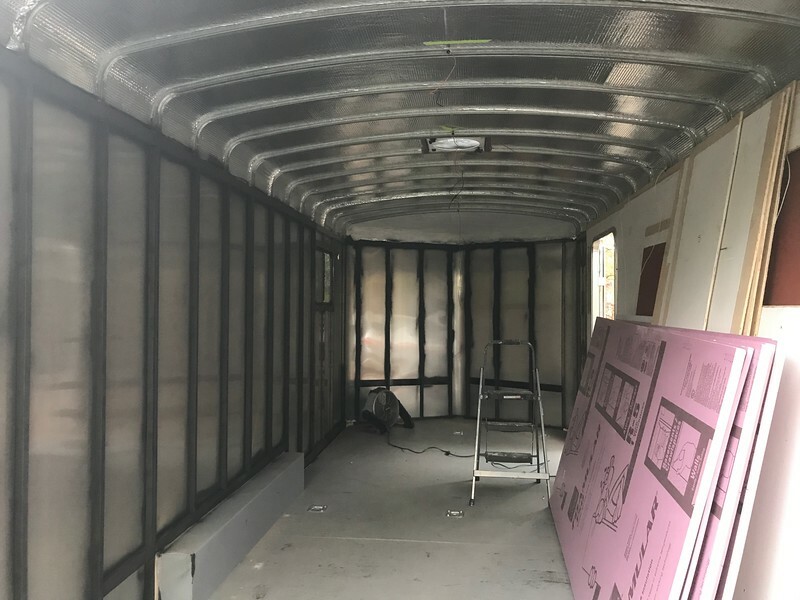 With an 18' trailer I'm looking at ~10 sheets to complete the walls. The foam board scores easily with a large utility knife. I found it easy to mark the dimensions with a few cuts from the knife and then connect these marks by dragging the knife along a 30" metal square that I have. The metal edge serves as a guide for the knife. After this initial cut I deepened the score by running the knife down the length again and then snap. The piece would easily pop out. Thanks for the great photos. You appear to be enjoying your build ... I know I am!